Abandon Hope - "Settle The Score"
The fitting soundtrack for destroying your living room furniture! Playing and writing the kind of music you like the most yourself, is actually everything a musician could dream of. You don't have to simulate fun and passion, you are in peace with yourself and you are totally wrapped in your music. 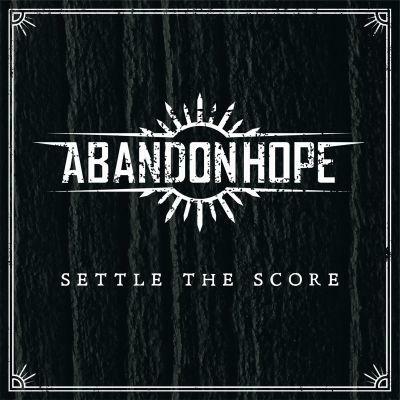 This is exactly what Abandon Hope are living in their new record “Settle The Score”! The logical result of this is, that the search for a perfect fitting genre ends up being tricky. So it's up to you to decide, wether the band plays Southern Metal, Heavy Blues American Southern States rooted Hard Rock or something else. „Imagine our sound as if Godsmack, Black Label Society, and Life Of Agony met for a BBQ at the shores of the great Mississ. This rich mixture slides down your throat like a hot marinated steak, finaly flushed down by a pitcher of cold barley brew.“ At no time the band has to be afraid of comparisons to big international acts, since not only the band's sound easily reaches professional levels. The incredibly varied vocals are standing out already while taking the first listen to the record and the songwriting quality is not one bit weaker than that. Abandon Hope always manage to fascinate the audience with tight grooves, driving riffs, varied song structures, and mature lyrics.